One thing we hear over and over again is that our panel extenders are so easy to install. Companies who feel intimidated by a complete overhaul of their cubicles cower at the thought of throwing the office into upheaval. Extenders, on the other hand, help you avoid the chaos and provide privacy in about as long as it takes you to walk across the office to get a cup of coffee. So, you can see why “easy” is a word that often comes up in discussions about our panel extenders. But ease of use is only part of the equation. Even low-quality solutions can be easy to set up. The key is to find a sensible, smooth solution that will last. Over the next few minutes, we’re going to walk you through how to install our panel extenders and what it is about their construction that makes them work so well. If you want to know how simple a project will be, tally up how many tools you need and how many pieces of hardware are involved. Our panel extenders come with three things: universal adjustable brackets, the panels themselves and an Allen wrench. Whether you’re doing a panel-mount or desk-mount installation, the hardware and tools are the same. Once you have your extenders in hand, installing them takes about 5 minutes. And that’s a true 5 minutes, whether you’re a handyman or you’ve never laid a finger on a wrench in your life. This photo is a great shot of our adjustable brackets. Our brackets come in two sizes: standard and large. The standards fit panels from 1.5-inches to 3-inches thick, while the large brackets fit panels ranging in width from 3 inches to 3.75 inches. Once these brackets are fixed to the existing panel, drop in the new panel tile and use the Allen wrench to tighten up the brackets and anchor the panel into place. 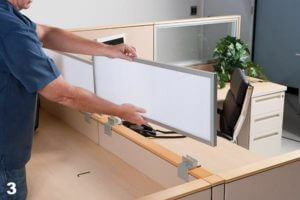 Our desk-mount panels are installed the same way, except the brackets are fixed to the ends of the desk. And that’s it; that’s how you install our panel extenders. Once your panel extenders are in place, you’re going to notice a difference in how much sound is able to penetrate your workspace. The reason why our panel tiles are so effective at blocking noise from reaching your desk is because they’re made out of a pair of quality materials specifically designed to deaden sound waves. Each panel is made of an outer fabric cover and an inner sheet of fiberboard. For our outer fabric we’ve chosen a fireproof, recycled product that provides the first barrier of defense. Once sound passes through the fabric layer, it encounters a thick layer of fiberboard. We use a type of fiberboard called Soundboard, known for its ability to deaden sound without adding too much bulk. Soundboard, as well as other materials, are rated on two different scales to determine how good they are at blocking sound. Those two scales are called the Noise Reduction Coefficient (NRC) and Sound Transmission Class (STC). The NRC scale goes from 0 to 1 and judges how well a material can absorb sound. Sound is divided into its own categories called frequencies. The frequencies we’re most concerned about are mid-range frequencies, which is the range in which you’ll find the human voice. Our panels have an NRC rating of 0.35, which represents a significant reduction in noise, including mid-range frequencies. STC ratings are scores that represent how many decibels are lost when a sound passes through the material. An STC rating of 20 means the material blocks out 20 decibels. To give you a reference point, the human ear perceives a loss of 10 decibels as a 50% reduction in hearing ability. The panel extenders we offer have an STC rating of 26; that’s a pretty big drop in noise. Overall, our acoustical tile panels are 50% better at deadening noise than non-acoustic extenders, and while they’ll cost you a little more than a basic plastic panel, you’ll get more than your money’s worth with a quiet, calm workspace that increases productivity and privacy.